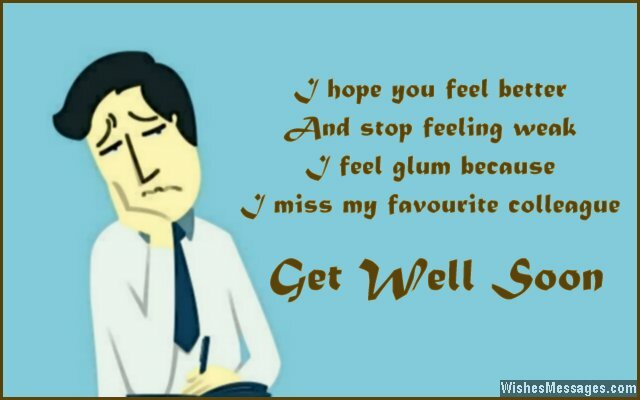 Get well soon messages for colleagues: Has one of your co-workers fallen ill? Send a sweet text to let your colleague know that everyone at office is missing his or her presence. Share some gossip in an email, post cute stuff on your colleague’s Facebook, write a few inspirational quotes on a greeting card and tag your co-worker in a funny tweet. After all, making someone feel better is all about letting them know that there are people who feel sad in their absence. 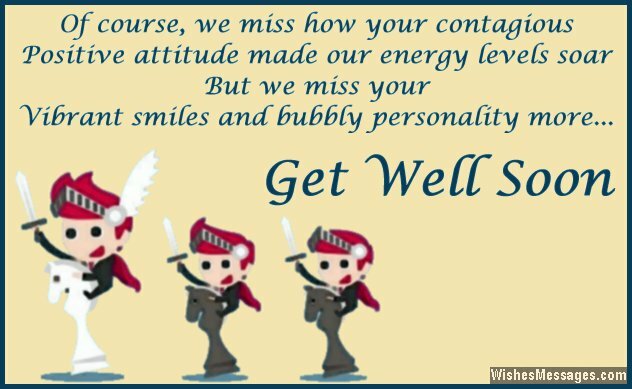 So don’t leave any stone unturned when it comes to sending your best wishes to a sick colleague. Hope for a speedy recovery so that the office can come alive with the smiles of your favorite colleague. 1) I hope you feel better and stop feeling weak. I feel glum because I miss my favorite colleague. Get well soon. 2) Stay at home, take enough rest. Go to the doctor, undergo all the tests. Don’t come to work, until you feel your best. But get well soon, at the very earliest. 3) The office is feeling empty without you. To talk about, there is nothing new. We are all waiting for you to come back, so at lunchtime we can catch up over a snack. Get well soon. 4) Management theories say that a congenial working atmosphere is made up of good office infrastructure and open dialogue. For me, it is made by having colleagues like you around. Get well soon. 5) There are many people to help you cope up with your sickness at home, but there is nobody to help me cope up with your absence in the office. Get well soon. 6) Do you know what inspiration, motivation and encouragement have in common? They have all been missing from the office ever since the day you fell sick. Get well soon. 7) I know you are not ill, you really want more time to kill. You want us to do all your work, while all your responsibilities you can conveniently shirk. Stop pulling these sickies because we can see through, come back soon because we miss you. Get well soon. 8) There is a lot of work to be done, and we are falling behind without our number one. Get well soon. 9) While the company is worried about its numbers taking a hit in your absence, I am worried about my happiness. Get well soon. 10) I come to office with a heavy heart and leave with an empty soul. Without you a colleague like you to work with, I feel bored in my role. Get well soon. 11) Your absence has not just left your cubicle empty, but our hearts empty too. Get well soon. 12) The word soon doesn’t convey the hurry with which I want you to get back to work. So here’s wishing you get well urgently. 13) Get well soon before I get sick and fall ill because of working all alone. 14) It’s funny how everyone in the office is feeling lethargic and tired even though it is you who has fallen ill. Come back soon, we miss you. 15) Going on coffee runs with you was all about catching up on the gossip of the day. Now, it is just about getting coffee. Get well soon, I miss you. 16) Of course, we miss how your contagious positive attitude made our energy levels soar. But we miss your vibrant smiles and bubbly personality more. Get well soon. 17 ) Your absence has proved that you are not just indispensible, but irreplaceable too. Get well soon. 18) Office without you is like a nightclub without music, cafe without coffee and a mall without shops – meaningless. Get well soon. 19) I have been able to cover up for your share of work, but the share of the smiles and laughter you spread in the office. Get well soon. 20) You are just an absent employee for the company, missing member for the team and an unavailable colleague for others in the department. But for me, you are a dear friend who lights up my boring days. Get well soon. 21) The doctors in the hospital don’t need your million dollar creative ideas, we do. Get well soon. 22) Your legs aren’t meant to limp with a fracture, but climb up the corporate ladder with speed. Get well soon buddy. 23) We are one man down in sharing all the yelling that boss gives us every day. Get well soon. 24) The official gossip monger, coffee runner, leg puller and joke cracker of the office is on leave because of a sickness. Get well soon, we miss you. 25) The company may have gone through a minor financial setback loss with your absence, but I went through a huge emotional one. Get well soon. 26) Our team’s biggest rival right now is not the competition, but an illness which is keeping a brilliant employee like you away. Get well soon. 27) Things are going well, but not happily enough. Projects are being completed smoothly, but not innovatively enough. Decisions are being made perfunctorily, not wisely enough– all because of your absence. Get well soon. 28) Imagining an agile mind, lithe body and an inspired soul like you being chained to a hospital bed is impossible. Get well soon. 29) My appraisal wasn’t the best this time because I didn’t have a colleague like you who brings out the best in me. So get well soon, I need you. 30) The ship of our team is sailing wherever the wind takes it. Please come back soon and adjust the sails. Get well soon. 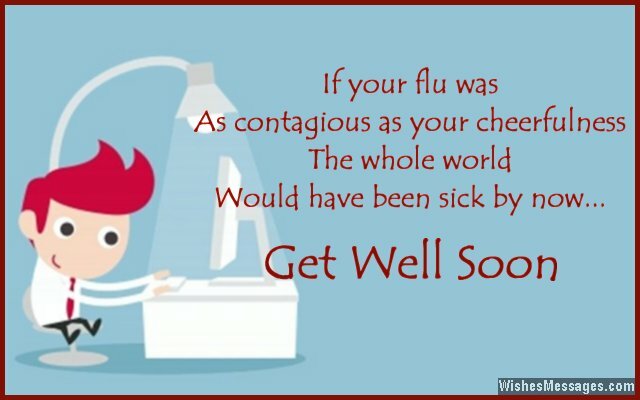 31) If your flu was as contagious as your cheerfulness, the whole world would have been sick by now. Get well soon, we miss your smile. 32) Just like how heat can never be understood without cold, a person’s value can never be understood without absence. We have realized your priceless value, now get well soon. 33) You may be brilliant enough to work from anywhere, in any situation and with any person. But we are not brilliant enough to work without you. Get well soon. 34) Without you, the office is more like a graveyard and my cubicle is more like a coffin. Get well soon buddy. 35) The virus in your body has affected my work as if a virus hit my computer. Get well soon buddy. 36) Throughout your career you have been successful in driving away irritating customers, annoying suppliers and unreasonable clients. I am sure that driving away the germs in your body will be a piece of cake. Get well soon. 37) Allow the doctors to give medicines to heal your body but don’t let them tamper with your genius brain – because we need that. Get well soon. 38) Now that your illness has kept you away, there is one thing that I must say. I have realized that having you around is such a big boon, I hope you feel better and come back soon. 39) Get well soon buddy. You are on sick leave, not on a holiday. 40) The doctors say that your illness is a tough one. But I know that you are a fighter from inside. Rough it out and come back to office better and stronger. Get well soon.